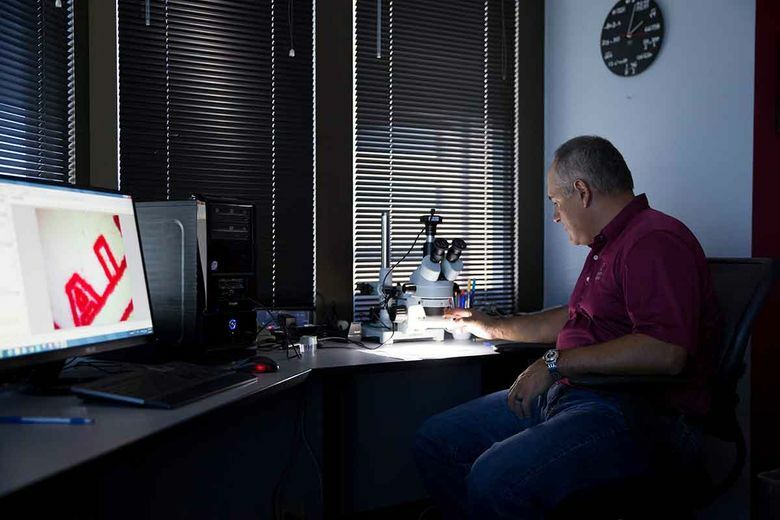 Alan Kreitl, 48, is a forensic document examiner at Affiliated Forensic Laboratory in Phoenix. Q: What’s involved in examining documents? A: The majority of what I do is handwriting comparison, to ascertain the identity of the person whose signature appears or whether a document has been forged. Sometimes I determine both. I work on civil cases at Affiliated Forensic Laboratory, such as when a family member contests a will. Q: What’s a memorable civil case? A: Once I testified in a civil trial about financial records from a woman’s estate. A man had been caring for his mother, and after she died, his sisters accused him of forging checks from her account. They wanted that amount deducted from his share of their inheritance. I was able to show what documents the mother signed and which ones the son forged. Sadly, the sisters lost more money trying to punish the brother than if they hadn’t bothered. Q: Don’t you also work on criminal cases? A: I have two jobs. I work on criminal cases for the Arizona Department of Public Safety, a law enforcement agency. In one case I worked on, a woman who was accused of killing her boyfriend was using the battered-woman defense. Her lawyer presented 10 letters, allegedly from her boyfriend, in which he apologized for abusing her. After comparing the handwriting in those letters with others he had written to loved ones, I testified at a pretrial hearing that the boyfriend had not written the first set. They were deemed inadmissible. A: I have a degree in forensic science with an emphasis in chemistry. I started working for the state of Arizona as a drug analyst in 1993, identifying drugs that were seized, including marijuana, cocaine and methamphetamine. When this forensic document examiner job opened, I applied, was hired and entered a two-year training program. I sat side by side with an experienced colleague while he worked, read articles about handwriting and pored over old proficiency tests. It’s a learned skill; you need to look at hundreds of handwriting comparisons to become proficient. Q: What other documents or items do you examine? A: Everything from bank robbery notes, bomb threat letters and other threatening letters to driver’s licenses and birth certificates. For an item that someone may have doctored, we have tools, such as the video spectral comparator, that uses ultraviolet light to verify whether someone has used a different pen to falsify a document. The difference in inks may not be apparent to the naked eye. Q: You often see the results of unsavory behavior. How do you deal with it? A: When I started, cases involving seniors or children being taken advantage of financially got to me, but I’ve gotten more cynical. Still, the vast majority of the population are good, law-abiding citizens. It’s rewarding when you can get justice for a victim, and even those who’ve been falsely accused.